We’ve seen some ace Black Friday deals so far, but these discounts on ESP LTD’s iconic Eclipse electric guitar really rule the roost, with three top-spec models available heavily discounted. 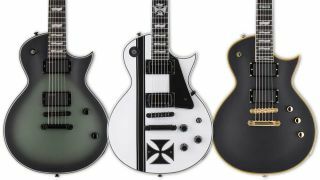 Walmart is selling James Hetfield’s Iron Cross signature and the EC-1000VB Eclipse for $678 each, while Bill Kelliher’s signature BK-600 clocks in at $649. That’s $307 off the EC-1000VB, $390 off the BK-600 and a whopping $521 off the Iron Cross. All three guitars share mahogany bodies and necks, and come with hardcases, but the difference lie in the top-notch pickups that feature in each model: you’ll get the EMG 81/60 set in the EC, EMG’s Het Set in the Iron Cross, and Kelliher’s signature Lace Sensor Dissonant Aggressors in the BK.